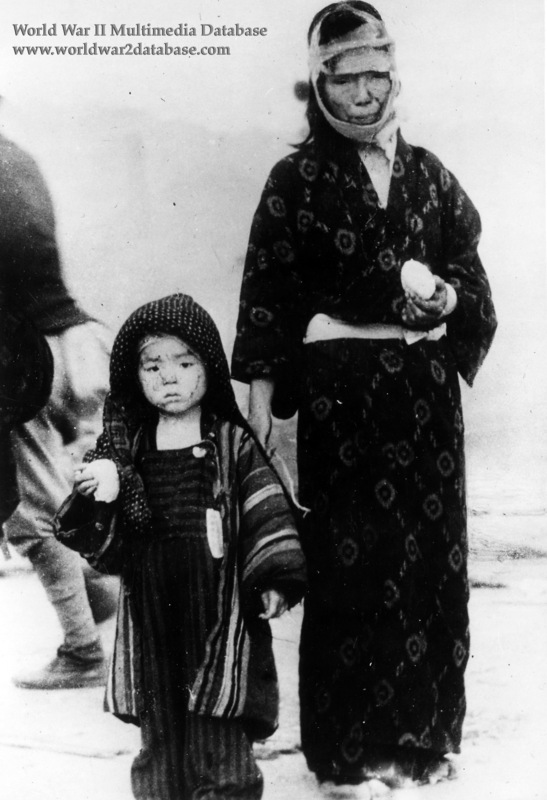 Around 1200 Hours on August 10, 1945, a mother and her child receive rice from a relief party Near Ibinokuchi-Machi (present day Takara-Machi), less than a mile (1.5 kilometers) south of the hypocenter. They are too stunned and exhausted to eat. This photo, one of a hundred taken by Army photographer Yosuke Yamahata, is part of the most comprehensive evidence taken immediately after the atomic attack. The photos were surpressed by both the Japanese government and Supreme Command Allied Powers. Later, Yamahata wrote, "The appearance of the city differed from other bomb sites: here, the explosion and the fires had reduced the entire city, about four square kilometers, (1.5 square miles) to ashes in a single instant. Relief squads, medical and fire-fighting teams, could do nothing but wait. Only the luck of being in a well-placed air raid shelter could be of any use for survival. Even if the medical and fire-fighting teams from the surrounding areas had been able to rush to the scene, the roads were completely blocked with rubble and charred timber. One had not the faintest idea where the water main might be located, so it would have been impossible to fight the fires. Telephone and telegraph services were suspended; the teams could not contact the outside world for help. It was truly a hell on earth. Those who had just barely survived the intense radiation - their eyes burned and their exposed skin scalded -wandered around aimlessly with only sticks to lean on, waiting for relief. Not a single cloud blocked the direct rays of the August sunlight, which shone down mercilessly on Nagasaki, on that second day after the blast. Although relief provisions and emergency supplies had arrived in the early morning, it was not until midday that rescue squads from Isahaya Army Corps and Omura Naval Cemetery arrived to administer medical care. I continued to photograph in these conditions until about three o'clock in the afternoon, when I had been ordered to set out on my return."